As long as you stick to a pretty decent doggy diet, everything should be gravy, right? Wrong. The most important thing with pet care is knowing what you can and can't feed your dog. That and capitalizing on your puppy for hilarious memes. As long as you stick to a pretty decent doggy diet, everything should be gravy right? Wrong. Turns out there's a ton of foods you probably didn't know about that can actually be really bad for your dog, including some that are perfectly healthy for humans. After all, there's nothing worse than having your dog suffer over a simple mistake in diet. While they're still man's best friend, they probably shouldn't eat like your best friend. 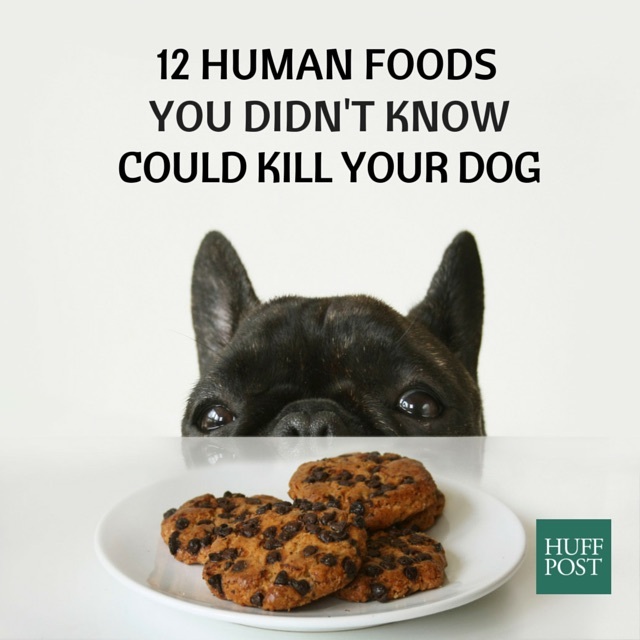 Because we at Foodbeast care about you and your canine companions, here are 12 human foods that your dog should most definitely avoid. What's In It: Chocolate contains caffeine and theobromine which fall under the methylxanthines category. When we hear the phrase "the darker the chocolate, the more dangerous," it's because white chocolates contain fewer methylxanthines. Thus, less toxicity. What It Can Do: If eaten by a dog, chocolate can cause vomiting, dehydration, abdominal pains, severe agitation, muscle tremors, irregular heart rhythm, elevated body temperature, seizures and death. What's In It: Milk contains milk sugar that dogs don't have the enzymes to break down. What It Can Do: Consumption of milk could lead to vomiting, diarrhea and other gastrointestinal problems. While it's not immediately life-threatening, it can contribute to serious bacterial exposure in dogs that could eventually lead to disease. What's In It: Like milk, cheese also has sugars and fatty components that dogs don't have the necessary enzymes to break down. What It Can Do: Cheese, and other dairy products, can cause problems if consumed in excess. Symptoms like gas, diarrhea and vomiting can all occur if a dog eats too much cheese. What's In It: Onions contain compounds that can be harmful to dogs if ingested enough. What It Can Do: Onions can damage red blood cells in dogs causing them to become weaker and move around less. If enough onions are consumed, a blood transfusion might be necessary. What's In It: The specific chemicals found in macadamias are still unknown right now, but they are known to cause a toxic reaction to dogs if ingested. What It Can Do: Dogs will develop weakness and an inability to walk, specifically in their hind legs. Vomiting, staggering gait, depression, tremors and hypothermia. What's In It: Like the chocolate rule, the stronger the onion the more toxic it can be. Since garlic is part of the onion family it's even more dangerous to dogs than onions per ounce. Garlic contains compounds that are strong in toxicity. What It Can Do: While the effect of garlic consumption to red blood cells won't appear for a few days in dogs, they'l be tired and reluctant to move. The dog's urine will be orange to dark red in color. Like with onions, a blood transfusion might be required in severe cases. What's In It: While its currently unknown what chemicals and compounds are in grapes that cause toxicity to dogs, the results of consumption can be pretty devastating. What It Can Do: Grapes and raisins can cause rapid kidney failure. While it varies between dogs, symptoms may not show up in them. Other than kidney failure, dogs can also develop vomiting or diarrhea as well as a lethargic state. Dogs will also develop dehydration and lack of appetite. Death from kidney failure may occur within three to four days. What's In It: Avocado leaves, pits, bark and fruit contain a toxin called persin. What It Can Do: Avocados can have toxic effects on dogs depending on the variety. They can cause upset stomachs in dogs, breathing difficulties, fluid buildup in the chest, but the most dangerous thing for them seem to the be the pit. Since it's slippery, the pit can accidentally be swallowed by dogs, leading to obstruction of the gastrointestinal tract. What It Can Do: Some of the symptoms that come from ingesting the toxin are dizziness, struggling to breath, seizures, collapsing, hyperventilation, shock and even coma. What's In It: The raw yeast dough from making bread can ferment in a dog's stomach, becoming toxic. What It Can Do: Aside from the toxicity from alcohol being produced in the stomach, yeast dough can also expand in your dog's stomach or intestines and create a large amount of gas in the digestive system. This can lead to severe pain and a potentially ruptured stomach or intestinal tract. Vomiting, abdominal discomfort and lethargy can also occur. What's In It: Coffee contains a stimulant known as Methylated xanthine. What It Can Do: Methylated xanthine stimulates the nervous system in dogs, causing vomiting, restlessness, heart palpitations and even death. What's In It: Foods rich in fat, like bacon, can lead to the disease pancreatitis in dogs. Once a dog has developed pancreatitis, their pancreas' become inflamed and stop functioning correctly. What It Can Do: This leads to all sorts of problems with digestion and nutrient absorption. It should also be noted that the amount of damage these foods can do vary on the specific breeds and sizes of your dogs. Like humans, all dogs are different and can react differently to foods. Though it's better to keep them away from these foods just for good measure.